The TS-98-V thermostatic valve has continuous pre-setting and readout, and is suitable for water heating systems in which hydraulic balancing via return valves is not possible or desired. 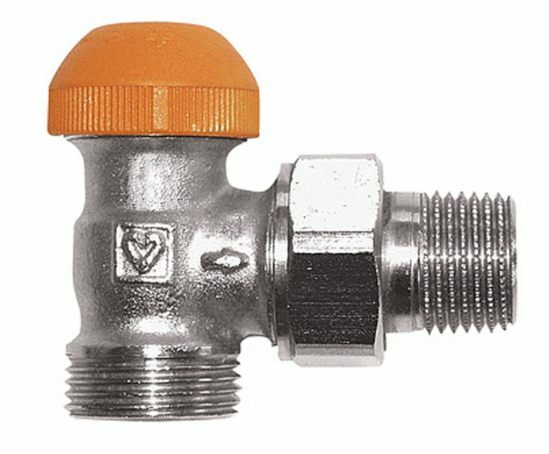 The universal models are equipped with special sockets that offer the option of connecting either a threaded pipe or a calibrated soft steel or copper pipe, the latter two by means of a compression union. Pre-setting is performed by means of a flow restrictor downstream of the valve seat enclosing the seat seal. This flow restrictor is continuously adjustable from the outside. It does not obstruct the working lift of the valve spindle. Pre-setting can be performed manually by means of the orange pre-setting button, by setting the pointer on the pre-setting button to the figure on the scale of the upper part obtained by calculation, or from the Herz standard diagram. For convenient pre-setting, the TS-98-V setting key is available, which engages with the teeth of the pre-setting button. The spindle seal is a special sealing ring that keeps maintenance requirements at a minimum and ensures ease of valve operation over a long period of time.